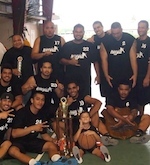 The American Samoa Basketball Association has already kicked off its first basketball league of 2014 with its annual Flag Day League. The day was full of surprises as the schedule came out with two games for the ladies and three games for the men that includes the shield game. The shield game is a quite similar to a championship game, however, the shield shall be passed on to any teams that defeats the current shield holder. At the end of the regular season, whomever has the shield will hold onto the shield until the next league. Thus, creating more of intense competitive environment to any team. The league promised to be a exciting as the ladies were up first. The young team of Swoosh were scheduled against a new entry to the league, CaBoom, which consisted of developmental players who were more eager to compete than win. Head coach, Carl Floor, wanted to focus more on developing his team based on grassroots. His team, consisting of majority of Under 14 players were very excited to play. Swoosh defeated CaBoom. The 2013 Mosooi champions, Lady Breakers, came ready to play with a revamped squad that consists of a mixed of national veterans and under 19 players. Nuuuli Turbo are a new team that promised to be a team to be reckoned with. It was a back and forth game that proved to be a preview to what the championship game might be. However, Turbo proved to be a tough team as they took their first win and handing the Lady Breakers their first lost. In the mens action was the shield game that had Army #1 vs Utulei. Led by Miguel Diaz, Army #1 proved to be a strong team. Utilizing fast breaks & ball movement, Army #1 dismantled Utulei and took home the shield. Army #1 will now defend the shield from any team to plays them. PrimeTime vs Lupelele was up next and it was a lopsided game that saw no change in pace. PrimeTime controlled most of the game with their defense and shooting. The end result had PrimeTime getting their first win. In the final game had Army #2 vs Futiama. This game was also lopsided as well as Futiama controlled the game from beginning to end. The closest that Army #2 came within was 9 points and Futiama open the gap in the third quarter and took it all the way be winning by 33 points.